Kittilä is a municipality of Finland and a popular holiday resort.It is located in northern Finland north of the Arctic Circle within the Lapland region. Explore hidden gems such as Seven Fells Up and Pallas-Yllastunturi National Park. Step out of the city life by going to Safaris and Elan Ski Shop & Rental. On the 4th (Thu), ski the day away in the pristine settings at Levi Ski Resort. There's more to do: hit the slopes at Yllas Ski Resort and make a trip to LUVATTUMAA - Levi Ice Gallery. To see ratings, reviews, maps, and tourist information, use the Kittila trip maker site . Tampere to Kittila is an approximately 5-hour flight. You can also do a combination of train and flight; or drive. Traveling from Tampere in April, you will find days in Kittila are little chillier (3°C), and nights are about the same (-4°C). 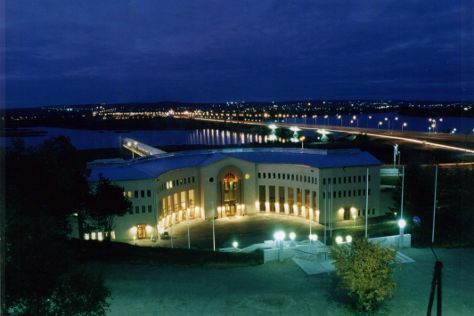 Wrap up your sightseeing on the 5th (Fri) early enough to drive to Rovaniemi. Discover out-of-the-way places like Kopara Reindeer Park and German Soldier s Cemetery. Step out of the city life by going to Safaris and Ounasvaaran Hiihtokeskus Oy. Take a break from Rovaniemi with a short trip to Pyha-Luosto National Park in Pyhatunturi, about 1h 30 min away. The adventure continues: take an in-depth tour of Arktikum, get in on the family fun at Santa Claus Village, see Santa Claus Office, and examine the collection at Christmas House Santa. For more things to do, reviews, and more tourist information, use the Rovaniemi road trip planner. Getting from Kittila to Rovaniemi by car takes about 2 hours. Other options: take a bus. In April, plan for daily highs up to 3°C, and evening lows to -3°C. Finish up your sightseeing early on the 9th (Tue) so you can catch the train to Kemi. Kemi is a town and municipality of Finland. On the 10th (Wed), contemplate in the serene atmosphere at Kemi Church, explore the world behind art at Kemin Jalokivigalleria (Kemi Gemstone Gallery), and then take in the architecture and atmosphere at Tornio Church. On the 11th (Thu), you'll have a packed day of sightseeing: get engrossed in the history at The Provincial Museum Of Tornio Valley and then tee off at Tornio Golf. To find ratings, maps, and more tourist information, refer to the Kemi travel route planning website . Getting from Rovaniemi to Kemi by train takes about 1.5 hours. Other options: take a bus; or drive. In April in Kemi, expect temperatures between 4°C during the day and -5°C at night. Finish your sightseeing early on the 11th (Thu) so you can travel back home.